Service: From ? to 1990’s? Funeral location: the Chapel, Parsons Funeral Home, 4 Princes Hwy, Dapto. 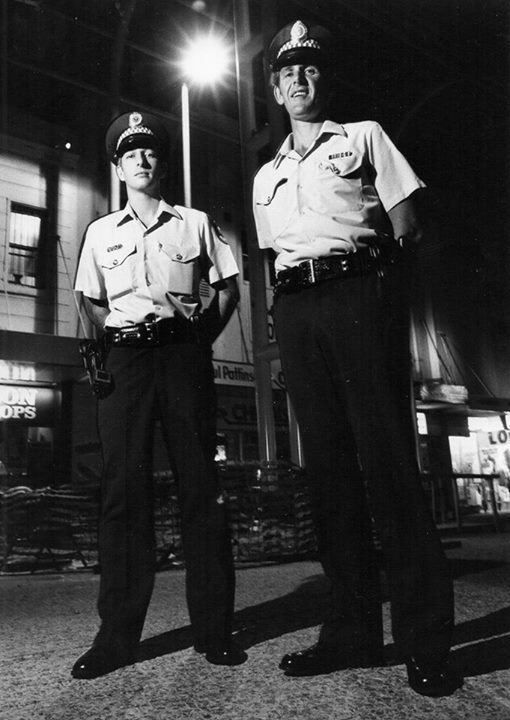 Constable Peter Dunn with Cst Jim Breeze in Wollongong Mall about 1984. Passed away February 12, 2015. Father of Beth, Sarah, Isaac and Abbey. Grandfather of Jordan and Ava. Son of Bevan and Kay. Brother of Adelle and Yvonne. Much loved friend of Sharon. Relatives and friends are invited to attend Peter‘s funeral service to be held in the chapel, Parsons Funeral Home, 4 Princes Highway, Dapto on Thursday at 10am. In lieu of flowers, donations to The heart Foundation would be appreciated. SHERIFFS attempting to evict a Warrawong man from his unit were forced to call in police when he threatened the officers with a crowbar, a court has heard.Police were forced to subdue Peter Bevan Dunn, 50, with capsicum spray when he refused to co-operate with the eviction order and repeatedly threatened to hit the officers with the crowbar if they entered the property.He was yesterday found guilty in Wollongong Local Court of hindering the sheriffs in the execution of their duties, and also assaulting a sheriff and a police officer.A further charge of assaulting a law officer was dismissed.Sheriffs Michael Riquelme and Geraldine Trimarchi went to Dunn’s Todd St unit on May 23 with an eviction notice from the Consumer, Trader and Tenancy Tribunal. The court heard Mr Riquelme attempted to speak with Dunn through the closed screen door and explain the process, however he refused to co-operate and instead grabbed a nearby crowbar and showed it to the officers. “He said if you do come in I will hurt you,” Ms Trimarchi said. Mr Riquelme told the court he felt fearful and, after Dunn slammed the door shut, called police. Four officers arrived a short time later and another attempt was made to speak with Dunn, who did not answer the door. Dunn told the court he had been in a back room using his computer and had not heard the officers. Lake Illawarra police officer Constable Giampiero Giuri told the court Ms Trimarchi made two attempts to kick the door open without success before he managed to kick the door open, revealing Dunn standing close by holding the crowbar above his head. Constable Giuri said Dunn was yelling and acting aggressively and, after making several requests for him to put down the crowbar, Const Giuri pushed Ms Trimarchi out of the way before subduing Dunn with capsicum spray. He was arrested and taken to Lake Illawarra Police Station. Dunn, an ex-police officer, said he had no intention of harming the sheriffs or police and was merely protecting his property. He told the court he had slammed the door shut out of fear he would be tasered by the sheriffs. Magistrate Shane McAnulty found Dunn guilty of three charges – obstructing a sheriff, assaulting a law officer and assaulting a police officer. Mr McAnulty said the assault had not involved battery but he was satisfied the victims had felt an immediate threat. He placed Dunn on a 12-month good behaviour bond.